Greece would consider a Russian financial lifeline as it looks to find a way out of its crushing debt burden to the European Union (EU). Greek Prime Minister Alexis Tsipras made the coded threat Friday as he shared a platform with Russia’s President Vladimir Putin at the St Petersburg Economic Forum. The revelation came the day after “cash for reforms” negotiations between Greece and its eurozone creditors collapsed, bringing a catastrophic default on 30 June another step closer to reality. According to the Independent, Mr Tsipras described Russia as one of “Greece’s most important partners” while lamenting the EU sanctions imposed on his host last year. Choosing words likely to be interpreted as a clear warning to the country’s creditors that Greece may look to Russia if the country falls out of the eurozone, Mr Tsipras suggested his country was looking at all its financial options. “We are at the centre of a storm, of a whirlpool. But you know we live near the sea – we are not afraid of storms, we are not scared of open seas, of going into new seas. We are ready to go into new seas to reach new safe ports,” he said before making no apology for accepting the invitation to share a platform with Mr Putin. This is not the first time Athens has considered Moscow for support in its five-year financial drama. At a previous meeting with Putin in April, Mr Tsipras undermined NATO’s position when he said European and American sanctions on Russia for its actions in Ukraine would lead to a new cold war in Europe. At the same gathering, Russia said it would pay for infrastructure projects in the cash-strapped Mediterranean nation. Bailout loans were not mentioned then but given the continued closeness of the two leaders that could be the next card played by Russia as it seeks an ally – any ally – in its diplomatic war with the west over its incursions into Crimea and eastern Ukraine. 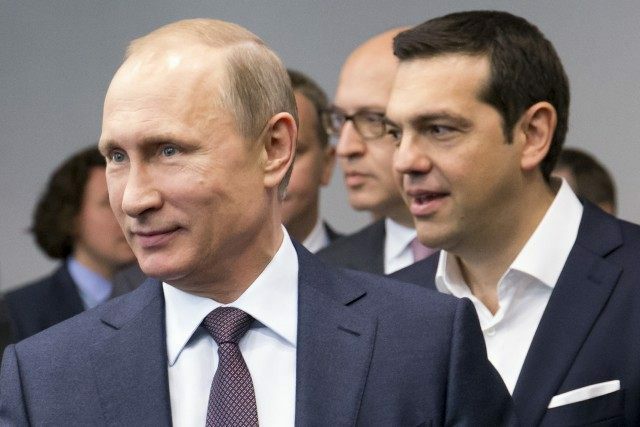 If Russia does turn out to be a new Greek economic savour, that’s bad news for the US and the EU and NATO. “You don’t want Europe to have to deal with Greece, who is a member of NATO, all of the sudden cozying up to Russia,” Sebastian Mallaby, a senior fellow for international economics at the Council on Foreign Relations warned. Mr Mallaby is quoted by FP magazine as saying giving Greece any wiggle room would send a bad signal to other European nations, like Spain and Portugal, struggling under the weight of years of unserviced debt. The next chance for a resolution of Greece’s financial troubles comes at an emergency EU meeting in Brussels on Monday. German Chancellor Angela Merkel has warned there must be a deal between Greece and its creditors ahead of that summit otherwise it would not be able to make any decision. “Let me make it very clear as to the expectations,” Mrs Merkel said. “Such a summit can only become a summit of decisions if there is something to base a decision on.